Panel glides also known as Vertical Drapes are a unique, stylish and contemporary product. Sliding panels of fabric are used as a beautiful window furnishing but are also very practical as a room divider. To maintain a universal look throughout the home or office you can have your Panel Glides made in all the same fabrics used for your Roller and Roman Blinds. 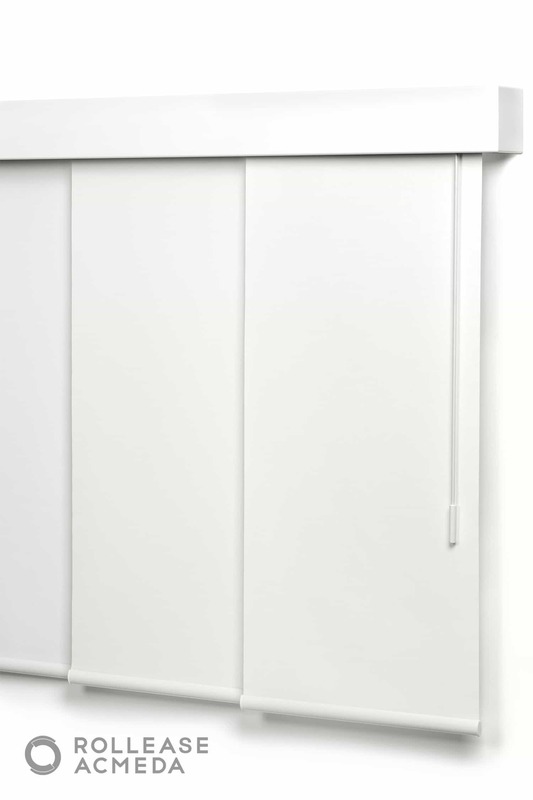 Panel Glides are also commonly used for sliding and bi-fold doors and as room dividers for Studio apartments and restaurants. Panel glides are considered a modern alternative to vertical blinds without the hassle of chains and trip hazards. Whether you are looking for a Sunscreen fabric which gently filters the light into your room while reflecting heat and glare, or a Transparent / Translucent (privacy) fabric which also allows light in to your room or even Blockout fabric to darken your room and provide privacy while you sleep, we promise that we can find a Panel Glide fabric to suit your situation. Blockout Panel Glides – ideal for bedrooms and home cinemas these fabrics block out light and reduce heat. Blockout fabrics give you privacy and protect furniture and flooring from sun effects like fading and bleaching. Translucent Panel Glides – Ideal for living areas these fabrics reduce light, reduce heat, offer privacy and protect furniture and flooring from sun effects like fading and bleaching. These fabrics are ideal when both privacy and light are wanted but no view is required. Transparent / Sheer Panel Glides – Ideal for living areas these fabrics reduce light, reduce heat, offer protection for furniture and flooring from sun effects like fading and bleaching. These fabrics are ideal when light is required, these fabrics also offer limited view through. Screen / Sheer Panel Glides – Ideal for living areas these fabrics reduce light, offer heat reduction and glare control while maintaining the view. All our blinds with varying efficiency reduce the heat as well as stop direct light, to help protect furniture, remove glare from TV and computer screens and help insulate the home during the winter. Panel Glides come in a variety of different control options and configurations to suit your window, sliding door, room divider situation. The two standard control options available from Nomad Blinds are Cord drawn and Wand (or flick stick) drawn. Both options are the same price and are best suited to specific situations. You will find our factory here.